Dazie Delights: Its friday so that means Little Musings Day! Oh this weeks musing is just fab! 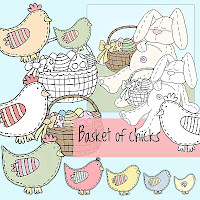 If you are getting prepared for easter its perfect for cards, gift bags with mini eggs in, cupcake decorations well just about anything. Or if you just like making beautiful cards with gorgeous images on this is for you! This weeks musing is a fab set of outline and pre coloured images! You simply have to have this set! Its only £1.50! I wanted to keep things sweet and simple as I think the images are just too cute! So I made a little set of Easter cards or spring notelets. Go check out what Sj and Caz made with this fab set! And grab it for yourself, here is a piccy of what you will get in your digi pack! Click the Pic to take you straight over to Sj's blog where the details of how to get this set are! Catch you tommrow for a brand new fortnight over at Craft your Days away Challenge! Woww a gorgeous card Dazie! Love the soft colours you used!